The perfect home for any type of celebration. A big birthday bash, wedding anniversaries, family and friend reunions, or just a relaxing staycation. Sleeps up to 33 in 18 bedrooms with 11 bathrooms. Weekends from £5,950 to £8,950, full weeks from £8,500 to £14,450. For shorter stays please enquire. If fully occupied, price per person per night is usually between £37 and £90. Escape to leafy Brinsop Court Estate; a secret gem nestled in the heart of Herefordshire, for a one-in-a-million wedding that stands out from the rest. Seats up to 96 indoors and the total venue capacity is 120. 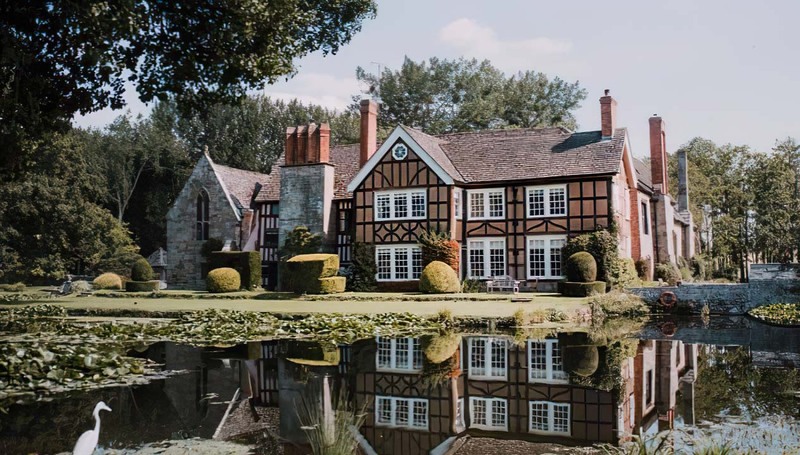 Brinsop Court is very special – it’s a picturesque moated manor house, tucked in the rolling folds of Herefordshire. The house is (as you might expect) built around a courtyard, and protected by a moat that encircles the whole of the main house. The house works brilliantly for private parties, weddings, business meetings and corporate events. There are eighteen bedrooms, and eleven bathrooms (sleeping up to thirty-three guests). Four of the bedrooms – all doubles – are on the ground floor, suitable for guests who would rather not use stairs. The house has a Queen Anne dining room, which seats 26 for a formal dinner, and a large drawing room (the Oak Parlour), with a log fire. There is also a large Games Room, where you can play table-tennis, snooker watch television, dance the night away and make full use of the built-in bar facilities. The gardens are beautifully kept, with topiary and ivy-covered bowers. There’s a hot tub, for the best-of-bubbly star-gazing. Brinsop’s extraordinary feature was hard to choose (that moat! ), but we think the 12th century banqueting hall takes a lot to beat. The hall has an exposed vaulted ceiling, and a large open fireplace and lit by atmospheric candle light. It also has a secret door for surprise exits and entrances! The hall can be used in several ways, seating 96 guests for dinner, and up to 100 theatre-style. Brinsop Court is deep within a private estate in Herefordshire, 30 minutes’ drive from Hay-on-Wye. The house is set in 800 acres, 250 acres of which is ancient woodland (with innumerable walks). The nearest village is Tillington, which has a fine country pub called The Bell, famous for making its soon-sold-out cider, ‘Tillington Belle’. A taxi costs around £20 from Hereford train station. Woodland walks, Cycling, Fishing, Stalking (Deer), Treasure-trails and clay-pigeon shooting. Would you like something we’ve not mentioned? Brinsop Court has an excellent team to support the organisation of your party or event. incredible place, stunning location, so relaxing. I hosted a family reunion there in 2015 and we all had an extraordinary and wonderful time there celebrating birthdays and family. We gathered from all over the world for a long weekend and were pampered and wowed by every detail of the property. We hope to do it again in 2020 and can’t wait to return. Unbelievably beautiful building. A most wonderful atmosphere. The decor is perfect, public rooms, bedrooms and bathrooms are luxurious. The grounds are wonderful, neat and relaxing. This must be one of the best wedding venues in the country and definitely the top one in Herefordshire and surrounding areas. Brinsop was the most incredible setting for our wedding, and also for a weekend with all of our closest family and friends. We felt at home from the moment we walked through the door and the friendly welcome we have received every time we visited made us love it even more. The hard work, organisation and passion the team put into making our wedding day so special was exceptional. We never felt anything was to much trouble and the attention to detail from everyone made us so relaxed - we couldn't have enjoyed the weekend any more! Ivy was an incredible end to the best weekend and the nicest start to married life, its a absolutely beautiful cottage. We have made memories we will never forget and couldn't have asked for a more perfect wedding so a HUGE THANK YOU to you all! We got married at Brinsop Court May 12th 2018. We arrived the Friday and left Monday. Cannot think of any words to describe it. Every room has its own individual feel and smell, the grounds are beautiful and wouldn’t have chosen any where else to get married. The staff are efficient, warm and welcoming (especially Harriet Duggan our wedding coordinator). From the crisp white sheets to the little welcome notes in each room it’s Perfection. Highly recommended to any one looking for the most magical day. Loved every minute, didn’t want to leave. Fantastic place. Took the whole place over for my son's wedding, great food and accommodation, fabulous grounds and amenities, highly recommended by all our guests. Wonderful place highly recommend anyone to have your wedding there , fantastic ! Brinsop Court, thank you all for being so welcoming, I loved returning to this beautiful, once family home, which is now a stunning wedding venue. I love my job styling hair and make up, I get to visit beautiful venues. Brinsop is up there at the top excellent co-ordinators always with a smile and go that extra mile for their clients. Beautiful venue. Stunning location, dedicated team and wonderful food! As a photographer shooting a wedding here I can honestly say it was one of the most beautiful places I have shot at. Well done! Watched my best mate get married here to his beautiful bride! One word, amazing! Brinsop Court and its staff are a cut above the rest. We got married here October 2016 and they couldn't do enough for us. They really do go the extra mile and treat you as as individuals. If you're looking for class, individuality and somewhere where they make you feel welcome and special. This is the place. We couldn't rate them highly enough!! After 6 years of searching home and abroad for a wedding venue we visited Brinsop Court, booked the venue immediately and were overwhelmed at the experience we received. The staff were extremely helpful, they floated in and out when needed, nothing was too much trouble, the house, facilities and views were spectacular and our whole day and weekend was just perfect. Safe to say I think our families will want to return at some point in the future for another big event. You guys have got something seriously special here and we can't thank you enough for giving us both an incredible experience and life long memories. I am not surprised at all at the recent awards you have received, I am sure there are more to come!! What a great wedding venue. Very relaxed atmosphere, beautiful buildings, facilities and views. Food was also great. As a Hair Stylist I am lucky enough to work at so many stunning Venues but I must say this place really is at the top of my list of favorites. The property and grounds are beautiful and the Bridal Suite is incredibly light and spacious which is wonderful for not only the Bride and her bridal party but her Hair Stylist, make up artist and photographer to all work together too. Plenty of space for us all. Fantastic wedding venue and wonderful team to look after you in planning and hosting your day! Our son and now daughter in law were married there last year in September. It was the most idyllic venue for their wedding. We all had a fantastic few days there it was perfect. Such a beautiful place. Would love to go there again one day. Highly recommended. Beautiful place.I had a fantastic time over there with my family celebrating an incredible wedding.I would definetly come back. Beautiful venue for our wedding -28.04.2016- Couldn't have found a more perfect place with absolutely wonderful staff that were so helpful! Especially Ali - what a brilliant lady smile емотикона 2 nights in Ivy cottage was an amazing end to to an amazing few days! Heres to Brinsop Court! What an amazing place! We attended for our daughter's wedding yesterday and it couldn't have been better! The rooms are fantastic and have to be seen to be believed. Everywhere was spotless. Roaring fires. Absolutely perfect for a winter wedding. The staff are amazing. Nothing is too much trouble. Ali was fantastic; she is there from dawn to dusk, anything you want she's already thought of and anything you need she's already done. She was particularly helpful in changing the sofa bed in the downstairs bedroom in Tyrrells House for a proper single when she realised it was being used by my 76 year old mother (something we had not asked her to do but she was not happy with her using a sofa bed). Her attention to detail is outstanding. Thank you Ali for making our two days run so smoothly. You're an absolute star! Lovely country retreat with all the family for Christmas. Above and beyond our expectations would definitely recommend to friends. I stayed here for a long weekend in the "Bailey" quarter. Wow is an understatement. The rooms are generous, gorgeous and the views are stunning. Ali who helped organize the weekend was such a great help and provided lovely homemade pre cooked food for us all. If anything, it would of been nice to have an option of a thinner duvet in the bedrooms. The room I stayed in was quite hot (despite having turned the radiators off). Such a shame I only stayed for a weekend! I had the honour of photographing Kay & Kieron's wedding at Brinsop Court earlier this month. A fantastic venue, a real treasure trove of photographic opportunities! Really hope to return to this amazing location soon! Had the most amazing New Year with special friends in the most incredible place. We were all sad to leave. Thank you Brinsop Court for treasured memories that will last a lifetime. We will be back.